Perfect to top your pizza. It's surprisingly easy to make, tastes way better than store-bought. 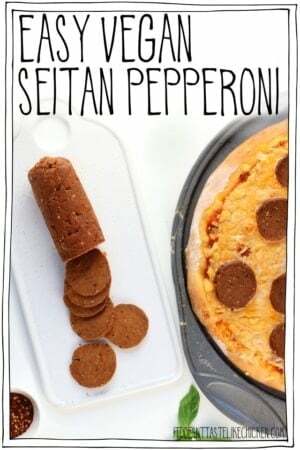 Can be stored in the fridge or freezer so you have it on hand whenever you need vegan pepperoni. Recipe adapted from my Vegan Seitan Steaks, but shout out goes to The Easy Vegan's version for the funniest video. Add several inches of water to a large pot with a steamer basket and bring to a boil. In the meantime, mix together all of the ingredients in a large bowl. Once the mixture starts to come together, finish mixing by hand, kneading the dough for 2 - 3 minutes to make sure it's combined well. Kneading the seitan will also give the vegan pepperoni a chewier texture. Divide the dough into two pieces then roll the dough pieces into two logs about 6 inches long each. Roll each log up loosely in a piece of aluminum foil then twist the ends closed. Steam for 30 minutes. Oil may release during steaming and appear in the steamer basket and water, and that's ok. After 30 minutes, remove the logs from the steamer and allow to cool completely in the fridge. The logs will have puffed up in the foil and become tight. Once cooled, remove the foil and they are ready to slice and enjoy as you like. *The coconut oil should be solid to make this recipe and get the best texture. To make sure your coconut oil is solid, store it in a cool place or the fridge. If needed you can replace the coconut oil for olive oil. If you use olive oil, omit the water. The olive oil pepperoni will have a grainier texture but will still taste good. *Make these pepperoni's ahead and store them in the fridge for up to 2 weeks or in the freezer for longer. *If you prefer, you can wrap the logs in parchment paper before wrapping them in the foil. *666 calories are for 1 whole log of pepperoni.